One of the themes running through the final few films featuring the original cast of Star Trek dealt with change. James T. Kirk had to decide whether he wanted to stay Captain of the Enterprise or move up to become an Admiral. When he did, he regretted it. Even as he was written out of the storyline in Star Trek: Generations his advice to Jean-Luc Picard was to stay in the Captain’s chair as long as possible. Change is also a predominant underlying theme of STAR TREK BEYOND. Chris Pine’s Kirk is considering change. Zachary Quinto’s Spock is also considering change. That is the set up, the framework on which screenwriters Simon Pegg and Doug Jung build a compelling action movie. The Enterprise and its crew have been exploring the galaxy for more than 3 years. They are tired. They stop at Star Station (or Space Station, sorry if I got that wrong) Yorktown for resupply. While there a ship approaches the station and because the United Federation of Planets welcomes all with open arms, the pilot is allowed in. She tells how her crew crash landed on a planet on the other side of a nebula and she asks for help rescuing them. Kirk volunteers the Enterprise to go and they make it to the planet only to be attacked by something. Or a lot of somethings. A swarm of metal pods that destroy the Enterprise. So, now Kirk, Spock, et. al. must find a way to save their crew and get back to Federation space without a ship in which to do it. The leader of the enemy is Krall, menacingly played by Idris Elba. Though he has a long way to go to chew scenery like Benedict Cumberbarch in Into Darkness. Krall seems to know more about the Federation than the Federation itself. We later find out why. No spoilers here. Krall also has a nasty habit of draining the life energy from people so he can regenerate himself. That is why when the Enterprise is destroyed and the crew flees in escape pods, Krall’s forces don’t destroy them, he takes them. Pegg and Jung’s love for the genre and this specific franchise is evident. Kirk is brash, but unsure of the future. Spock is logical to a fault. Bones is well, Bones. They work Leonard Nimoy’s death into the plot nicely. But it was sad to see Anton Yelchin who died just a few weeks ago. 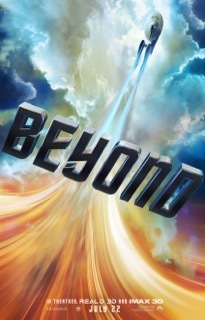 The movie works on a lot of levels, but mostly it is a very good adventure that is faithful to all that is Star Trek. Justin Lin capably takes over for JJ Abrams. His experience with action movies (Most of the Fast and Furious franchise) shows. He know where to place the camera and get the audience rapt in the action without being confused or nauseous from motion sickness. Pegg, Jung and Lin keep it relatively simple. That is always a plus in these kinds of movies. They tend to go off the rails when they get too thinky or obsessed with too many characters. In a summer where other big franchises disappointed (SUPERMAN V. BATMAN and THE X-MEN) it is nice that some things do not change. The material is familiar and comfortable. It is even nicer to see those responsible honor the Star Trek Universe, respect the fans and do not completely screw up the whole thing.